Purpose The aim of the study was to evaluate high-pitch 70-kV CT examinations of the thorax in immunosuppressed patients regarding radiation dose and image quality in comparison with 120-kV acquisition. Materials and Methods The image data from 40 patients (14 women and 26 men; mean age: 40.9 ± 15.4 years) who received high-pitch 70-kV CT chest examinations were retrospectively included in this study. A control group (n = 40), matched by age, gender, BMI, and clinical inclusion criteria, had undergone standard 120-kV chest CT imaging. All CT scans were performed on a third-generation dual-source CT unit. For an evaluation of the radiation dose, the CT dose index (CTDIvol), dose-length product (DLP), effective dose (ED), and size-specific dose estimates (SSDE) were analyzed in each group. The objective image quality was evaluated using signal-to-noise (SNR) and contrast-to-noise ratios (CNR). Three blinded and independent radiologists evaluated subjective image quality and diagnostic confidence using 5-point Likert scales. Results The mean dose parameters were significantly lower for high-pitch 70-kV CT examinations (CTDIvol, 2.9 ± 0.9 mGy; DLP, 99.9 ± 31.0 mGyxcm; ED, 1.5 ± 0.6 mSv; SSDE, 3.8 ± 1.2 mGy) compared to standard 120-kV CT imaging (CTDIvol, 8.8 ± 3.7mGy; DLP, 296.6 ± 119.3 mGyxcm; ED, 4.4 ± 2.1 mSv; SSDE, 11.6 ± 4.4 mGy) (P≤ 0.001). The objective image parameters (SNR: 7.8 ± 2.1 vs. 8.4 ± 1.8; CNR: 7.7 ± 2.4 vs. 8.3 ± 2.8) (P≥ 0.065) and the cumulative subjective image quality (4.5 ± 0.4 vs. 4.7 ± 0.3) (p = 0.052) showed no significant differences between the two protocols. 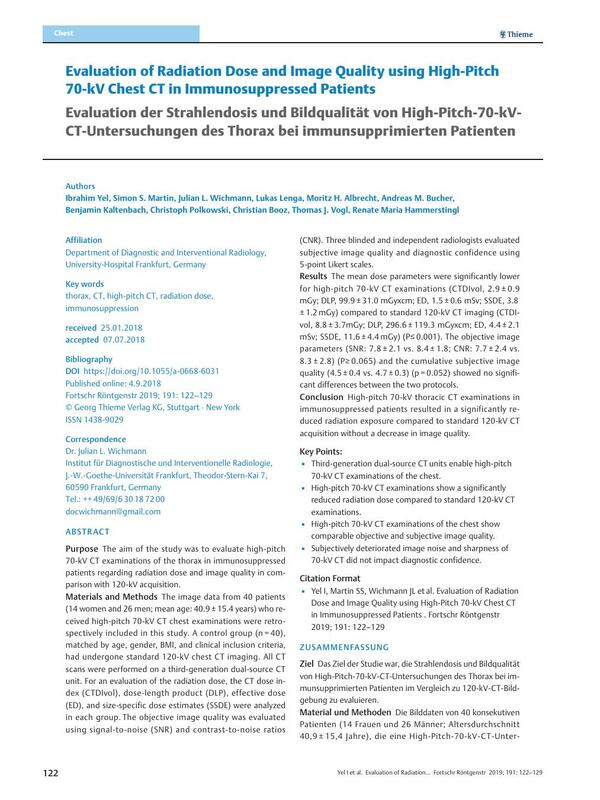 Conclusion High-pitch 70-kV thoracic CT examinations in immunosuppressed patients resulted in a significantly reduced radiation exposure compared to standard 120-kV CT acquisition without a decrease in image quality. Third-generation dual-source CT units enable high-pitch 70-kV CT examinations of the chest. High-pitch 70-kV CT examinations show a significantly reduced radiation dose compared to standard 120-kV CT examinations. High-pitch 70-kV CT examinations of the chest show comparable objective and subjective image quality. Subjectively deteriorated image noise and sharpness of 70-kV CT did not impact diagnostic confidence. 4 Ewig S, Höffken G, Kern WV. et al. S3-Leitlinie: Behandlung von erwachsenen Patienten mit ambulant erworbener Pneumonie und Prävention – Update 2016. Deutschen Gesellschaft für Pneumologie und Beatmungsmedizin.